Claims that the economic model proposed by the Growth Commission is ‘anti-austerity’ do not stand up to scrutiny. There appears to have been a concerted effort on behalf of the report’s sponsor and authors to claim that it proposes an economic model that would have avoided the austerity of the last 10 years. To test these claims and whether or not the report’s assertion is consistent with the report’s actual recommendations, we first have to decide what is meant by ‘the model we have suggested for reducing the deficit’. 3.184: Target a deficit value of below 3 per cent within 5 to 10 years. 3.185: National debt should not increase beyond 50% of GDP and should stabilise at that level. 3.186: Borrow only for public investment in net terms over the course of the cycle. 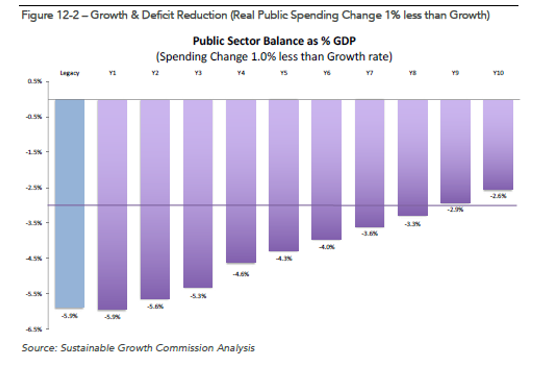 3.187: During the transition period real increases in public spending should be limited to sufficiently less than GDP growth over the business cycle to reduce the deficit to below 3% within 5 to 10 years. At trend growth and target inflation rates this would mean average annual cash spending increases of above inflation in contrast to the Scottish budget experience under the UK regime of recent years and that scheduled for the remainder of the current planning period. 3.188: The impact of fiscal management on growth must be tended to and it should be noted that this rule will apply over the business cycle. This means that in periods where growth is expected to be substantially lower than longer-term trend, it will be possible to increase public spending to create the necessary economic stimulus to increase growth. Ambiguity is introduced into these summary recommendations by reference to ‘the business cycle’, a term which is open to interpretation and not defined within the report. The report itself observes that none of the 12 benchmark SAEs run a deficit as high as 3% and in fact most run a surplus.7B7.12 Given that 3% is also defined as the ‘excessive deficit threshold’ by the EU8Launching an Excessive Deficit Procedure, it seems clear that the Commission concludes that running a deficit of less than 3% is a requirement for fiscal credibility and recognises the need to achieve this within 10 years (although as we’ll come on to argue in chapter 6, this does not appear to be a sufficiently aggressive target). Our interpretation of the report’s recommendations is therefore that getting an independent Scotland’s deficit below 3% within 10 years11The Commission insists on using the phrase “within 5 to 10 years” - this is clearly intended to mean “within 10 years” would be a non-negotiable priority and constitute their first Fiscal Rule. If this is not a non-negotiable priority, then we fail to see how the Commission can credibly claim to be seeking to emulate its chosen 12 successful SAEs (or indeed even begin to build the reserves required for its currency strategy or to prepare to meet the EU’s entrance criteria). This illustration makes clear that, using the Commission’s optimistically projected “legacy deficit”, spending growth would need to be 1% behind GDP growth to satisfy their first Fiscal Rule. We have been able to recreate the Growth Commission’s model to a reasonable degree of accuracy16Our key sanity check is not just the deficit outcome but the implied debt/GDP after 10 years. In our simple model this comes out as 36%, identical to the figure the Commission quote [B12.18]. It should be noted that this simple model implicitly and somewhat simplistically assumes that revenue/GDP is not affected by spend/GDP and this allows us to place the assumed decrease in spend as a percentage of GDP (spend/GDP17It looks as if the Growth Commission are using GDP including N sea oil in the denominator – that is what we have assumed (it is not a major factor when it comes to the conclusions drawn)) in historical context17Note that the GDP figure used for the denominator in this graph is GDP including North Sea Oil. [Figure 4]. 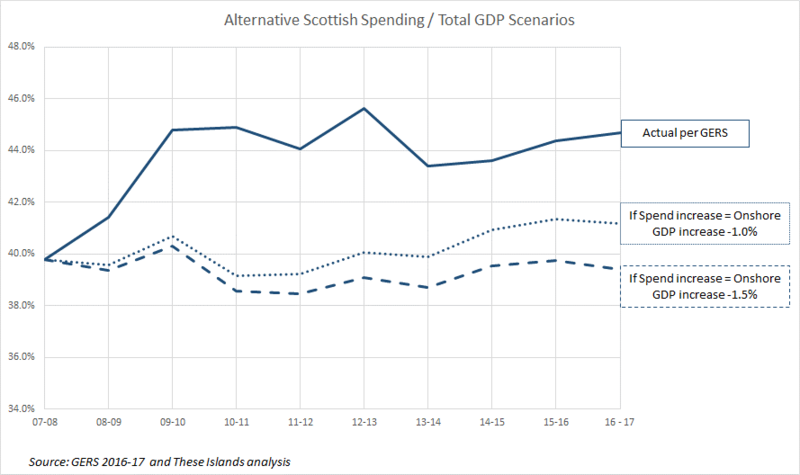 The graph clearly shows that the implied reduction in spend/GDP is far greater than anything Scotland has recently experienced (or is forecast to experience within the UK). 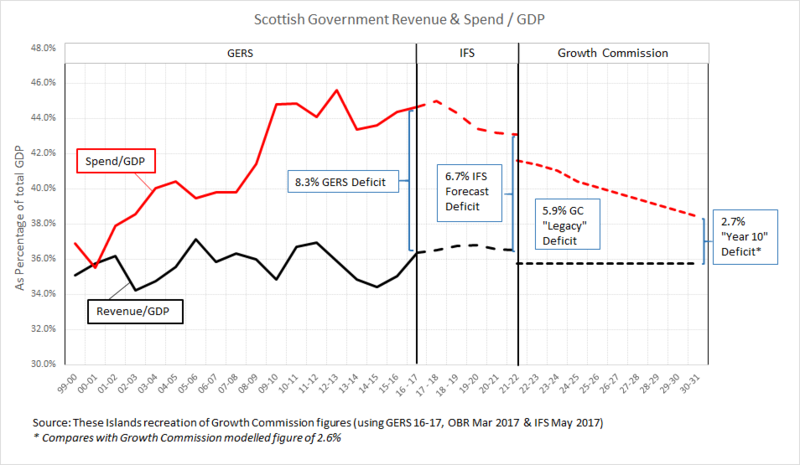 In fact, if we remove the cost saving optimism from the Growth Commission’s assumptions (which is what causes such a large step down in spend/GDP in the graph above) then spend growth would have to lag GDP growth by 1.5% to still get the deficit under 3% within 10 years. Claims, like those made by the First Minister, that the Growth Commission recommendations would have “eradicated austerity” over the last 10 years simply do not stand up to scrutiny. Average real onshore GDP growth in Scotland over the last decade has been just 0.8%20Using 2016-17 GERS figures and applying the HMT GDP deflator and 10 years ago the onshore deficit was over 8.7%.218.7% based on total GDP, 10.4% based on onshore GDP This means that strictly applying the Growth Commission model – which requires spending growth to be “limited to sufficiently less than GDP growth”223.187 to get the deficit below 3% within 10 years would actually have required spending growth to be c.1.5% behind GDP growth. A simple graph (Figure 5) shows the difference between what actually happened to spend/GDP under ‘Westminster austerity’ and what would have happened if spending growth had been constrained to either 1.0 % or 1.5% less than GDP growth over that period.23The denominator used here is total GDP (including North Sea) whereas the GDP growth used to define spend growth is onshore only – this is why spend/GDP actually goes up in the 1% scenario, because offshore GDP declined over this period. 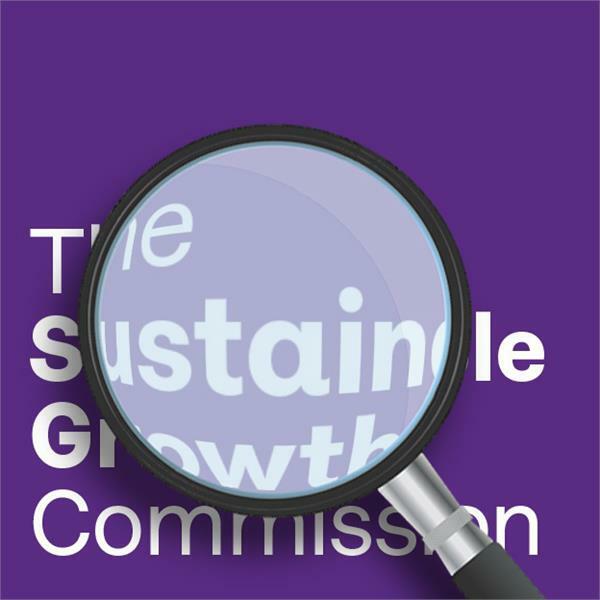 The impact of applying the Growth Commission’s recommendations retrospectively is unsurprising – they lead to materially less spending in Scotland than actually occurred over the last decade. This finding is intuitively obvious given Scotland’s onshore deficit was actually 8.4% in 2016-17. The Growth Commission’s first Fiscal Rule would have required that to be brought down below 3% over the preceding 10 years by limiting increases in spending. The net result would therefore have inevitably been a dramatic reduction in spending, far beyond anything seen under what the Growth Commission refer to as the “austerity model pursued by the UK”. Indeed by not proposing to reverse any of the recent or planned spending cuts27In fact the Commission explicitly states “Scotland’s replication of UK budget spend currently allocated to Scotland in a number of areas is assumed to be unchanged for our analysis including welfare, pensions, economic development and scientific and university research funding.” [3.140], the Commission implicitly accepts that these are a necessary (but not sufficient) condition for making the Scottish economy fiscally sustainable on a stand-alone basis. The report states “planning for additional cuts over and above those already planned is likely to be counter-productive”28B4.20, but makes no proposals to reverse any of the previous cuts. This means that the Commission makes no plans for spending increases to reverse such policies as the benefits cap, the 2-child tax credit cap or increases to the state pension age. The anti-austerity rhetoric is completely disconnected from the detail of the commentary and recommendations. If applied retrospectively, the recommendations would have led to far greater austerity than Scotland has experienced over the last decade and led to roughly £60bn less spending. The commission has claimed to reject the existing ‘austerity model’ but has replaced it with one that is necessarily harsher. Necessarily so because, unlike the situation for Scotland remaining within the UK, the Commission suggests than an independent Scotland would have to get its deficit below 3% within a decade. Based on realistic assumptions, the Commission’s recommendations would almost certainly lead to many years of even greater austerity for an independent Scotland.